The Australian battalions of the Imperial Camel Corps (ICC) played a vital role in the defence of the Suez canal in the face of the Ottoman offensives across Sinai in 1916. These badges were worn on the slouch hat and on the collar of the uniforms of the Australian members of the ICC. The badges are made of oxidised brass. 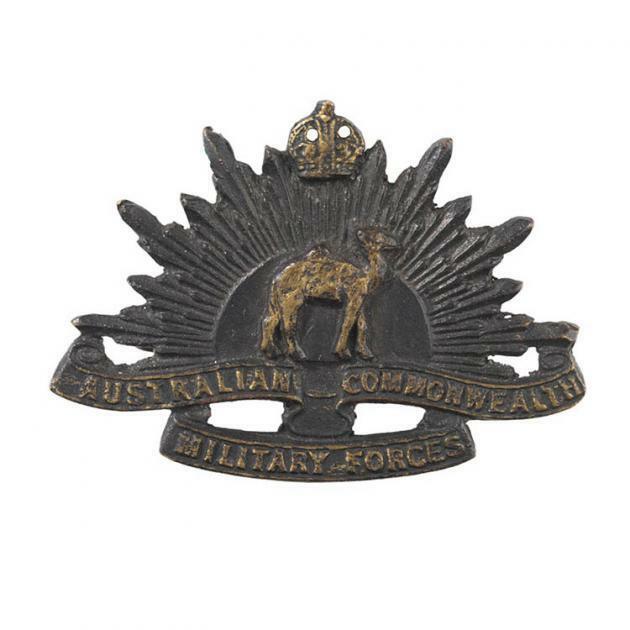 The design of the badge is based on the Australian general service or 'Rising Sun' badge. It uses the rays of the sun above the scroll AUSTRALIAN COMMONWEALTH MILITARY FORCES but in place of the Royal Crown the badge has an embossed walking camel facing to the right. The collar badge is identical to the hat badge but smaller. The badges are cast, probably by local badge makers, rather than stamped or die struck as the Australian made rising suns are. These badges were unoffical as the soldiers should have been wearing their national general service badge. In the case of the Australians this would have been the 'Rising Sun', the British their lion and unicorn supporting the coat of arms badge and the New Zealander's badge with its design of the fern leaf and 'NZ' above 'Onward'.